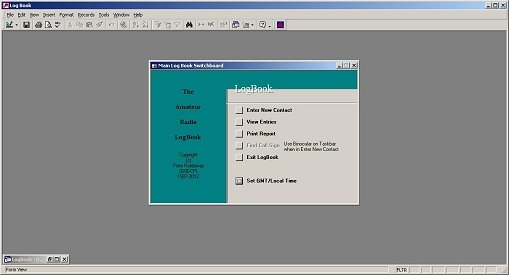 This is a newer version of my logbook program. 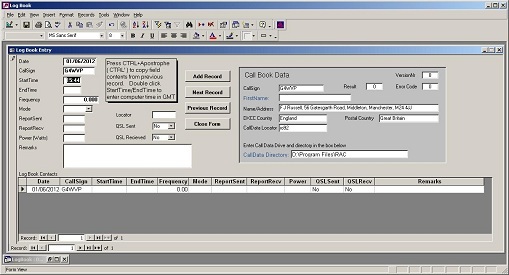 To run this program, you must have Access 2000 and to use the Call Data section. You must have the Whitehorse Radio Amateur Callbook. I would recommend you unzips this program into it's own directory and rename it 'Logbook'. There is also an enclosed icon, of which you can use on your desktop for the short cut. You can now log the time in GMT/UTC or local time and should work with all versions of the Whitehorse callbook. In this version you have to enter the path to the Whitehorse callbook by hand. Once again. It is recommended that you do not use this version in office 2007 or office 2010. For some reason only known to Microsoft it will cause office 2007 and office 2010 to reinstall itself. (Don't forget, you must have Microsoft Access 2000 or later for this file to work).